A few notable application upon trying to open which, we get this error are File Explorer, Internet Explorer, Start menu, etc. Since these apps are crucial, the issue could cause a total work stoppage. 1] Press Win + R to open the Run window and Enter the command cmd. Upon pressing Enter, it would open the Command Prompt window. Press Enter, let the command run and restart the system. This will help detect corrupt operating system files and replace them. In case your system’s ExplorerFrame.dll file is corrupt in itself, the previous solution wouldn’t work. In this case, we could try an SFC scan. 1] Open the Command Prompt as suggested in the previous solution. 2] Type the command sfc /scannow and press Enter. The System File Checker is a utility which is integrated with the concept of Windows Resource Protection. Since protected files on the system are not supposed to be modified, it checks for any such modification and restores the changes, if any. Please read more about the same here. 1] Press Win + R to open the Run window. Enter the command dcomcnfg. Upon hitting Enter, it would open the Component Services window. 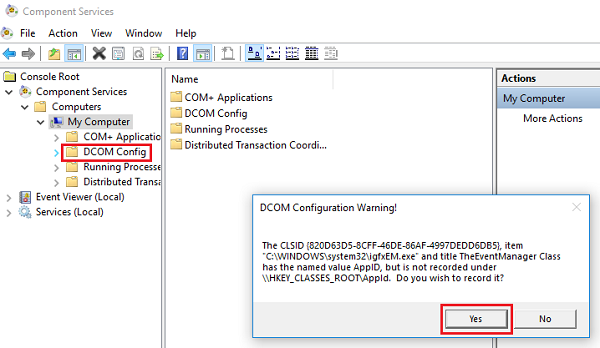 The moment you click on DCOM Config to expand the list, prompt windows would start popping up. Keeping clicking on Yes for each of them. It would help fix all DCOM errors. 1] Open the Run window as suggested in previous solutions. 2] Locate the Internet Explorer ETW Collector service. Since the services are listed in alphabetical order, it wouldn’t be difficult. 3] Right-click on it and then click on Start. It would initiate the service.